These sentiments are reprinted with the permission of Tricia Seeberg, who submitted them to the US Forest Service and both town councils of Crested Butte and Mount Crested Butte in July 2008. 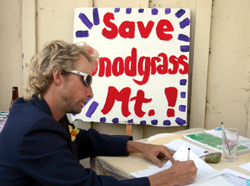 I feel compelled to make public some of my reasons why I would like to see Snodgrass Mountain remain lift-free. For those who do not know me, I moved here in 1995, have been a disc jockey at KBUT since 1996, and am actively involved with Crested Butte Mountain Theatre. That doesn’t represent the half of it, and if you’d like to learn more, please feel free to contact me. First, I'd like to clarify the notion that the Friends of Snodgrass Mountain and others who oppose any development on Snodgrass are anti-CBMR, dislike the Muellers, or believe that the Meullers should "pack up and go home". These are sentiments bandied about by some proponents of the development that are not only incorrect but harmful to any kind of hoped-for concensus in our community. We do appreciate the improvements the Muellers have made on the mountain, and we support their continued efforts to provide a great ski experience on Crested Butte Mountain. FOSM is a group of like-minded people that have come together for a common cause. They are not backed by sponsors. And no one is on a payroll. Most of FOSM have been around here a long time and have been year-round recreational users of Snodgrass and simply wish to see it remain free of commercial development. My opinions are not based on extensive ski studies, marketing studies, or proof that increased skier terrain will or will not bring more skiers, tourists or revenue to our area. These thoughts are based on philosophical and emotional concerns after reading such studies, but which I believe to be as valuable as any economic impact. 1. With the abundance of ski resorts in Colorado, no one needs to tear up another mountain to satisfy either the profit of one private company or the needs of intermediate skiers who have numerous other options. Earth is a small place and we should not continue to destroy it for our own pleasure. 2. I believe that the existing mountain and its services can be improved to provide a better experience. I know CBMR has a grand plan for major improvements (some recently approved by the USFS). But that plan doesn't seem to include better wages for employees, better customer service, improved relations between employees, managers and owners, and a cultivation of trust and respect either among their own employees or many in the community. 3. I believe that a good portion of the people who want Snodgrass developed are not representative of a skier base that will be sustained year after year and is one that will see generational fluctuations that will negatively impact the area. Many are older generation skiers who might have been rippers in their younger days and can still handle extreme terrain. But they're slowing down and have a limited number of years they can ski. Many are simply good intermediate skiers of many ages who just want more. They do not have a desire to improve and explore the vast terrain we have, nor do they think they should have to go someplace else. They truly believe we owe it to them to give them more. They see this mountain across the valley and say, "Let's put more there." We don't have enough blues? Why is that a bad thing? People made a choice to live in or visit Crested Butte knowing what we have, which is an expert mountain. Intermediate terrain exists all over the state of Colorado. If anything, we have a niche that can be exploited, something the rest don't have: a great mountain with tremendous opportunity to ski it. If someone moved here or purchased a second home speculating that the Muellers and CBMR would succeed in developing Snodgrass, then he ran the risk of losing if we stop the development. To evaluate devastating effects of catering to particular generations or demographics, check out many things we did for baby boomers. Not all of it came out rosy, and created a glut of products and services for which many lost their shirts. I believe such activity led to the highest rate of personal bankruptcies in history. 3. I believe that CBMR is motivated by money, not by the health and welfare of this area's residents. There would of course be extra work for some people (mostly construction, much of it imported from out of town) and a short-term influx of revenue for certain services in the valley, but money is not the only thing that drives our community. Is money the thing that persuades the Forest Service? The beauty of this area is the prime reason in any survey why people visit or move here. The pristine, untouched area. That includes Snodgrass. CBMR will not go bankrupt if Snodgrass is not developed. Will the Forest Service? I realize it will receive revenue from the permits, but so much that it would sacrifice the fact that we cannot go back? 1. I do not believe that the majority of locals want this project to move forward. I believe that strong marketing efforts on CBMR's part along with John Norton's unbalanced, skewed ideas in the CB News "Norton's Notions" continue to promote the benefits to have a kind of brainwashing effect on people. It's an age-old marketing and advertising tool that has been quite effective, even if what it promotes or sells is not in the best interest of the public or even necessary (look into the old Kodak 200 speed film). 2. I do not believe that this town or the area will suffer drastic economic losses if Snodgrass is not developed. CBMR is the private entity that stands to benefit the most from this development, and is the only entity which stands to lose the most. I doubt that local businesses will turn significant profit from the development. They might see marginal increases, but not enough to speed up their retirement. And building things to employ the incredible increase in carpenters and other construction workers simply to employ them is no reason to tear up a mountain. (A construction boom brought them here; a construction bust can likewise have them move on.) By the way, even with our record snowfall this year and amazing visitor traffic, local businesses do not report increased sales. Restaurants probably, but not the rest. Just because they're here doesn't mean they spend money. If CBMR is smart, it should step back and reevaluate what it has and focus on improving it. If it needs real estate to maintain operations of a ski mountain, it should either focus on making Prospect and Wildhorse much better than they are (these are two CBMR real estate projects that have numerous infrastructure problems and slow sales; building on the properties is difficult as well); or it should accept that it won't get the real estate sales that will accompany Snodgrass development and open its mind to different opportunities. Come up with a different plan if the one you have is not going to work. And study the Taos Ski Mountain model, which seems to be based on a tremendous skiing experience, not real estate. 3. I do not believe that tearing up or altering a mountain in this day and age for profit of a few and an easier outdoor experience for a few is morally acceptable. 4. I do not believe that the Muellers have our best interests at heart. "Our" meaning people like me, average folks who work for meager earnings, are unable to buy a place to live, who gaze upon the mountain everyday, who have lived here long enough to see changes that really haven't improved life for the valley (even though such growth was supposed to bring grand benefits to the working person), and who actually put more than just our own money into the economy. I volunteer time and give money to area causes and I have friends here. Year-round friends, not see-you-next-year friends. 5. I do not believe the development will bring more jobs. In the short run, it will increase the number of out-of-town labor and will provide jobs for a smattering of local construction workers who might be lucky enough to gain employment with the imported contractor. Once houses are built, I do not believe the supposed increase in jobs for property managers and maintenance companies will be a benefit. Those companies will be overbooked and not have the employees to do the work. They'll pay less than fair market value for home maintenance (along local wage lines), or bring in people who will then have to find affordable housing, causing an existing housing crunch for to pinch harder. That will cause people to live down-valley, increasing traffic beyond the current unbelievable line that makes its way up the valley at least five days a week. 6. I do not believe that CBMR should be able to take a publicly accessible playground with free admission and deny the public its advantages, and then keep the revenue for itself. I don't know how else to put it. This country doesn't need more ski terrain. We simply have some people who want it. I have spoken with visitors, some wealthy folks, and real estate agents who support the expansion. The first two categories have always been generations over 50 if not into their 70s; or women who have psychological fear of skiing (of which I'm all too aware, but work through on the existing amazing terrain). The real estate agents are driven by greed, sales and the un-proven idea that expanded terrain will bring in more people. Our area doesn't need more people. We are splitting at the seams as it is. This epic winter [of 07/08] should prove that, with grumbling town folk who disrespected the plow crew and berated the Town for not hiring more operators. I have seen a drop in people helping people, a rise in small crime, an increase in domestic violence, an alarming need for people to speed, a widening gap between the haves and have-nots, "haves" who like to distinguish themselves as such, "have-nots" who are secluding themselves but who are intelligent people and an increasing difficulty for some people to believe this is an accepting town. Our town is agitated, and the expansion can only make it worse. In the long run, is it worth it? Is the profit to the few worth the loss to the many? And will our community be able to rebuild some of the safety and comfort some of us have lost in recent years due to expansion? Because I'll tell you, we've lost a lot. And that breaks my heart. I do value the improvements that CBMR has made under the Muellers. But I implore the Forest Service to uphold its mission of managing public lands and to do so in a responsible manner. Turning a public asset into a private company's revenue-generating asset, depriving the public of the terrain as it is, stripping large amounts of forest to make way for south-facing ski runs, de-foresting a mountain which is home and migration to numerous animals, causing potential avalanche conditions where none currently exist - this just doesn't sound that responsible to me. My brother summed it up perfectly: "Skiing is an outdoor sport. It's not supposed to be easy." I sincerely hope the Forest Service denies CBMR the permits to develop Snodgrass Mountain. I believe it would take so much away from us, so much we can't get back. Thank you for reading these thoughts. I appreciate it. Postscript: Tricia Seeberg is now part of Friends of Snodgrass. Officially. When she wrote the letter, she wasn't. At present, she is the webmaster and still believes in the letter she wrote in July 2008.